Black Guillemots are stunning looking birds. In summer, the sooty black plumage contrasts with the striking white patch on the wing, conspicuous both at rest and in flight. At close range, red legs and orange-red gape can be seen. In winter, upperparts look scaly grey and under-parts white. That distinctive white wing patch is still visible in winter but the black element of plumage is restricted to wingtips and tail. The Black Guillemot or to give its Shetland name “tystie” is a circumpolar species, concentrated around the North Atlantic, Barents Sea, Baltic and smaller numbers around the Chukchi Sea in northern Alaska and north-eastern Siberia. Approximately half of the Black Guillemots breeding in Britain and Ireland do so around the Northern Isles, with the remainder confined mainly to the coasts and islands of north and west Scotland, Ireland and the Isle of Man. 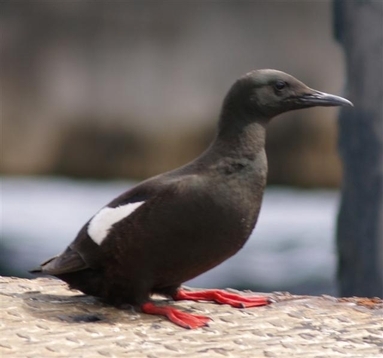 Between 1985-91, there was an expansion in the range of Black Guillemots, in particular the colonisation of new sites around the Irish Sea, including man-made structures like harbour walls, jetties, piers as well as into north east Scotland. Black Guillemot is a member of the auk family that includes Guillemot, Razorbill, and Puffin. It is the only member of the auk family that breeds on Arran. Whereas Guillemot tend to breed in large sea cliff colonies in their thousands, Black Guillemot prefer low-lying, indented stretches of rocky coast with their nests hidden in rock crevices and under boulders. The breeding colonies are small, loose groups of a dozen or so birds. There are a number of these colonies around the coast of Arran. Their distribution is determined by the availability of suitable nest cavities that are safe from land predators such as rats, mink, and otters. One of these colonies is in Brodick pier. It was first reported breeding there in 1993. This year there were three nests. The birds are usually on their nests from late April to mid July laying one or two eggs. Unlike other members of the auk family which tend to go to sea in winter, the Black Guillemot is much more sedentary with few moving far even in a mid winter, with the result that they can be seen around the coast of Arran all year. The reason that they may be seen close to the shore and frequently around harbours is because they mainly feed close to the sea bottom. They are opportunistic, taking small fish and crustaceans like gobies, blenny, stickleback, butterfish, shrimps and prawns. When you are on Brodick pier, making your way to or from the “Caledonian Isles”, have a look round the harbour and hopefully you will see this delightful bird.